Callum Gentleman is out & about on a solo Spring tour. There will be stories, blues hollas, old songs & new. 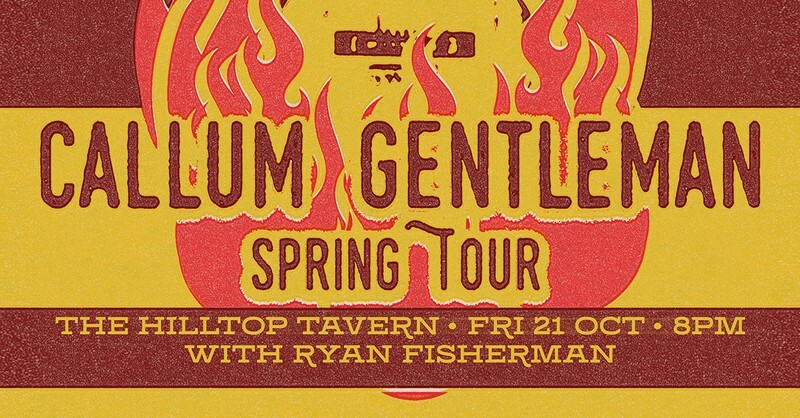 For the Hilltop Tavern gig, he’s being joined by fantastic Christchurch musician Ryan Fisherman. Callum Gentleman plays blues-folk noir with the odd dash of country. It’s Nick Cave meets The Smiths in a dark alley where they conspire to kidnap Bob Dylan and move to New Zealand. It’s Tom Waits sharing a bottle of moonshine with Leonard Cohen at 4am. But above all, Callum is a storyteller. These stories come out as songs, poems, campfire yarns and whiskey-soaked bar banter. Tales told with a silver tongue. He’s also the wordsmith for Panhandlers. Ryan Fisherman is "Chiwi" born musician from Christchurch. A keen advocate of kiwi music, Ryan has performed or been a member of, many local bands such as Doprah, Nakey, Fraser Ross (Band), Sand Fly Bay, Rickshaw, Golden Orange, Sister Something, Sabine Wojnar & Asian Tang. Originally a drummer, Ryan decided to learn various instruments to help hone his skill as a songwriter & musician. He records most of his music from home which is available via Band Camp & Spotify.